Disclosure: Sometimes products are provided in exchange for my honest review. Whether you are planning an adventure of a lifetime or just want to play around with your GoPro, a multitude of accessories are a must have. Of course, the GoPro itself captures the video with great quality, it is just a camera. Without the right mounts, that camera can’t perform at its best. From a head strap to a floaty, accessories make for a better GoPro experience. When it comes to GoPro accessories, the variety is key. When you go out on vacation or just out for a ride, the best mount can vary. For example, a head strap might be great when skiing down the mount, but it isn’t the best option when diving underwater. Think about it. The head strap can show where you’re going and what you’re looking at. But, under water, that head strap might only capture a bunch of bubbles from your air tank. A chest strap or a wrist strap might be a better option. Since you’ve probably spent a decent amount of money on your GoPro, it can be a difficult to spend another large sum on all the different mounts for your camera. Luckily, the 31 in 1 Sports Accessory Kit has a great bundle accessory package that offers the variety that users want at a price that they appreciate. This accessory pack has 31 different mounts that can capture any and every moment on your GoPro. When you buy an action camera, you need more than just the camera to capture all those moments. From high adventures on the water to quiet moments watching the sun set, each moment can benefit from a different camera angle, position or mount. These 31 camera mounts ensure that the GoPro user will have the right accessory for any occasion. Bundled in a convenient carrying case, this accessory bundle is perfect for the next family trip. There is ample space in the case (we could even put the GoPro in the case too (removed some of the dividing pieces). The accessories can go from the water adventures with the floaty and chest mount to fast paced movements like the head mount and wrist strap. The fun part of using a GoPro is taking it on all types of adventures. But, these adventures require different mounts. By buying the mounts in a bundle, like this one, the camera users can experiment with different mounts to determine which ones work best for the moment. Personally, I like the tripod for long, capture movies. It's great to mount to a car or boat (i.e. a jeep on safari). Wrapping it around bar, like on the jeep, it was quite secure and we could turn the GoPro on and off easily. For underwater captures, like diving, I would recommend the chest mount. A tip, make sure that the camera faces out, not down. Tighten the mount properly to ensure that it captures the image right in front of you. The chest mount was helpful to keep hands free and capture everything that was in front of us. 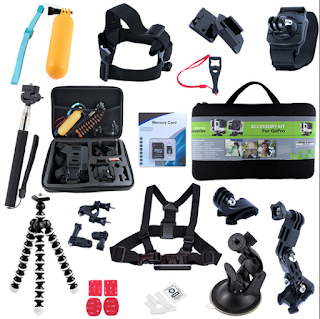 I would recommend this accessory bundle for families who are traveling with their GoPro. It provided great options for capturing all the travel memories. With all the options, families could buy one bundle and have enough accessories for all their devices. Disclosure: The company provided this item for my review. All opinions are my own.